Why Is This Squirrel Wearing a Sweater? This squirrel was found lying on a sidewalk after he had toppled from a tree. It's very rare for adult squirrels to fall, as their lives depend on their balance and dexterity. So why had this one lost his grip? WildCare Medical Staff developed a theory once this squirrel was on the examination table in our Wildlife Hospital. A skin scraping test and an ear swab confirmed that a terrible case of mange and ear mites had made the squirrel so itchy he had torn ragged holes in the skin behind his own ears with incessant scratching. Medical Staff guessed that the squirrel's frantic scratching may also have caused him to lose his balance and fall to the ground. Medical Staff immediately gave the squirrel medications to treat internal and external parasites including mites. But these medications can take up to 72 hours to take effect. Meanwhile, the poor squirrel continued to scratch. If you have ever experienced the agony of a severe case of Poison Oak, imagine that sensation inside your ears! This might help you understand why this squirrel continued to obsessively claw at his skin, despite the pain of his open wounds. The challenge was to figure out how to prevent him from doing this. WildCare's Medical Staff trimmed his claws and filed them, and even tried putting protective pieces of tape on each rear foot, but these measures weren't enough to protect the wounds from reopening. For a cat or a dog, you would use an Elizabethan collar (also known as an e-collar or, to quote Pixar, the "cone of shame") to prevent scratching, but squirrels have such short necks and dexterous paws, it's impossible to keep an e-collar in place. Fortunately, Director of Animal Care, Melanie Piazza had a plan. From a scrap of material, essentially a tube sock with the toes cut off, she created a squirrel sweater. The rolled neck of the sweater would protect the injured areas behind the squirrel's ears while they had time to heal, and a turtleneck sweater with arm holes would be difficult for even an adult squirrel to remove. Difficult, but not impossible. 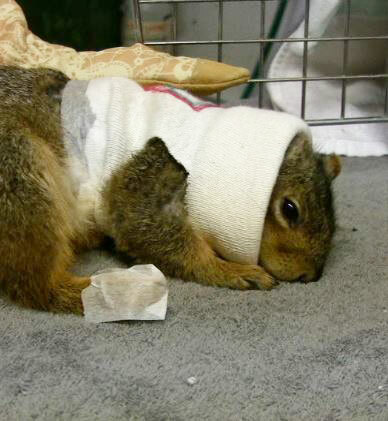 Squirrel patients are notorious for removing bandages of all types. Would the sweater design stymie this patient? The obsessive nature of the squirrel's scratching and his discomfort were so extreme, Dr. Scheenstra prescribed steroids and mild sedation to keep him comfortable. Fortunately, this treatment had the added benefit that it kept the squirrel calm enough to leave the sweater alone, providing the additional layer of protection his wounds needed to heal. Squirrel patient #127 wore a turtleneck sweater for three days. The sweater was changed daily to allow cleaning of the wound and prevent infection. With each cleaning, Medical Staff was gratified to watch the wounds healing and, as the anti-parasite medications took effect, the mange and desperate scratching abating. Finally, after almost exactly four weeks in care, this squirrel was no longer scratching and his wounds had healed cleanly. It was time to let him go free! David Meyers, his rescuer, volunteered to release him back to the Mill Valley location where he had found him, and brought along a camera to film the event. You can watch David's video of the release below. In the spirit of the best wildlife releases, this squirrel leaped out of his carrier and disappeared without a second glance -- the perfect ending to his story.